Quintessential Parisian Ines de la Fressange blogs about the art of ageless dressing. If you were under the impression that hip, moneyed, twenty-something stylists and would-be models were the only people blogging about what they wear, you are certainly mistaken. 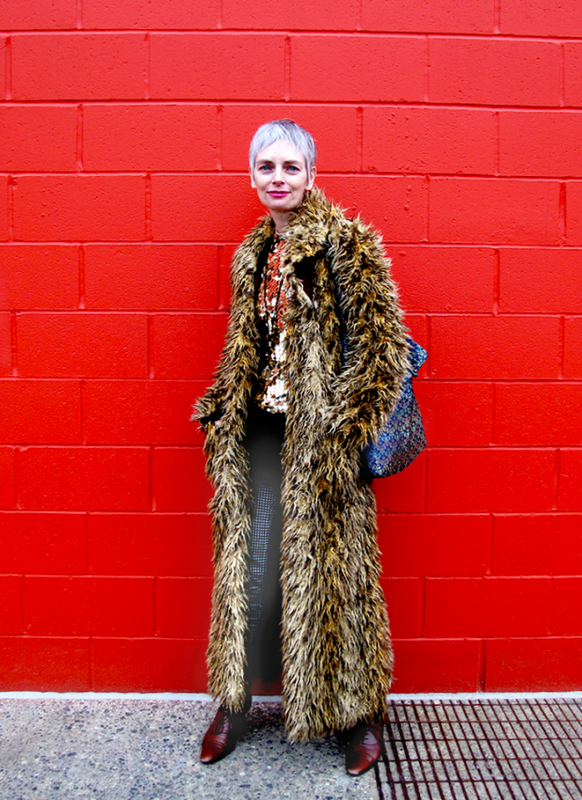 These mature-aged style bloggers – some even in their, gasp, 50s – are just as inspiring. They play into a wider movement happening in fashion and beauty right now. From Céline recruiting ever-cool 80-year-old literary legend Joan Didion to 71-year-old Joni Mitchell gorgeously strumming a guitar while clad in Saint Laurent. & Other Stories snagged 93-year-old design darling Iris Apfel (whose documentary we cannot wait to see) for their New York store launch, as did Alexis Bittar who featured her in their campaign alongside 18-year-old Tavi Gevinson. Selfridges' latest campaign is themed 'Bright Old Things', profiling 14 individuals celebrating "retirement renaissance". And countless of beauty brands are jumping aboard, too. Tilda Swinton, 54, for Nars. Jessica Lange, 64, for Marc Jacobs Beauty. Helen Mirren, 69, and Diane Keaton, 68, for L'Oreal, just to name a few. And it's no coincidence. When mainstream brands recruit glammed-up senior citizens to model their wares, it's easy to be cynical. They usually do so with a lot of PR-drummed fanfare. The strategic casting is trumpeted as a feminist and anti-ageist triumph, re-posted and gushed about by the world's most stylish Instagrammers. Their inclusion usually feels like a stunt for tweets more than actual progress, especially when that same brand resorts back to a dewy-faced, twenty-something, 'it'-girl model to front their campaign a season later. The rise of older women in fashion and beauty campaigns is certainly progressive for an industry that's traditionally subsisted on the commodity of newness and youth, but old age is not the new black – and it shouldn't be treated as a trend. As Hannah Marriott posits in The Guardian UK, "While buzz beats invisibility, why aren't there more representations of age in fashion and less fuss?" That's where these trendsetters come in. The humble personal style blog has managed to pique our interest once again – this time as a means of promoting and providing visibility to a long-overlooked demographic. As our culture evolves closer towards a 'beautiful at any age' mentality, these bloggers offer an important point of voice. They demonstrate fashion for an older audience in a real and practical sense, with a (sometimes) focus on affordability and styling for those 'in-between' age categories – 40s, 50s and 60s – that's severely lacking from most style coverage. Accomplished and confident in the way they dress, they portray an understanding of beauty and style that the younger generations can look forward to. And in a sea of lithe-limbed, light-skinned, pretty young things clad in leather tops and distressed denim, seeing an older face is a refreshing break from the monotony. As brands find new ways to expand their customer base, leave it up to these mature-aged ladies to showcase the universal appeal and wearability of their designs. Their inclusion here isn't tokenisation or fetishisation – just appreciation for an expertly accessorised, well put-together ensemble. Lyn Slater is indeed the 'accidental icon'. After being snapped at NYFW and photographed on the streets by Japanese tourists, friends encouraged the 60-something New Yorker to start a blog to document her daily ensembles. Her sense of dress is avant-garde, experimental and intellectual, with Ann Demeulemester, Issey Miyake, Comme des Garçon and Yohji Yamamoto on high rotation. Want to dress like a chic Parisian? Of course you do! Look straight to Inés de la Fressnage, the 57-year-old Chanel and Yves Saint Laurent muse and Uniqlo collaborator who has built an entire career out of sharing fashion, beauty and lifestyle tips. "I'm always sharing my notebooks, and it finally got unmanageable; I had to put it all in a much bigger place," she told Style.com. Enter La Lettre d'Ines, her recently launched blog that covers everything from putting together a total look for under 70 euros, to customising Birkenstocks and her go-to shoemaker if ever she needs her Viviers and Louboutins spruced up. Here's proof you can nail cool, gamine charm well into your 50s and 60s. Catherine Summers launched her blog on her 39th birthday to see if she could improve her style as she approached her 40s. Now 42, she's acquired a loyal fan following and is now known as the 'Queen of Clash' due to her penchant for pattern mixing and eye-jolting brights. Judith Boyd, 71, never leaves home without a hat. As a collector of vintage wares since the 70s, she has no shortage of theatrical and elegant toppers, many of which have caught the eye of fellow blogger, Ari Seth Cohen from Advanced Style. "Every hat has its own personality and the more interesting, the better," she says.